DRIVING OUT OF YELLOWSTONE over the Bear Tooth Pass Highway, one experiences a truly mortal encounter with their fate. Motoring above cloud cover with little between the pavement and plunge? Possibly the snow slows one down long enough to develop real appetite? Either way, out of the Pass, the first few choices are typical tourist town smack. Keep driving. A little further. To Red Lodge, my friend. On the north edge of a very walkable business district, conveniently placed upon a corner with plenty of parking, lies the answer to life’s riddle; “How do I compete with the scenery of Bear Tooth Pass?”. Begin with one Taco Carne Asada, designed and built by Mike Muirhead. Then try a small burrito. Or another taco, different flavor? The chips and salsa are a must. This is not the salsa you gorge upon as a mini-meal; besides, you don’t get enough in their serving. You do get a robust explosion of flavor upon their freshly-cooked chips. A value at twice the price! My first impression was that the food far exceeded my expectations. The waitress explained the chef was from LA. I spied it in his focused, steely eyes, from the start. The passion for flavor. Seriousness for the product delivered. A professional making this one small taco joint his life. What makes it so good? I called a few days later, and Jake gave it to me straight. Lots of work! The crew starts their day 5 hours before the 11am opening. EVERYTHING is made fresh, from scratch, daily. Trim the steak, marinate in “secret” ingredients, make the masa (corn meal dough) fresh every day, cook it to order, et cetera, et cetera, et cetera!!!! And this is just for my taco! I was tired just imagining the amount of work involved! Maybe I’ll pay the $2.95 per taco, and stick to plumbing? Make it part of your life. Find the time to make a trip to one of America’s great eateries. The Bear Tooth Pass Highway will make an excellent addition to a perfect day! Mike Muirhead’s culinary journey has taken him from Florence, Italy, to Beverly Hills. 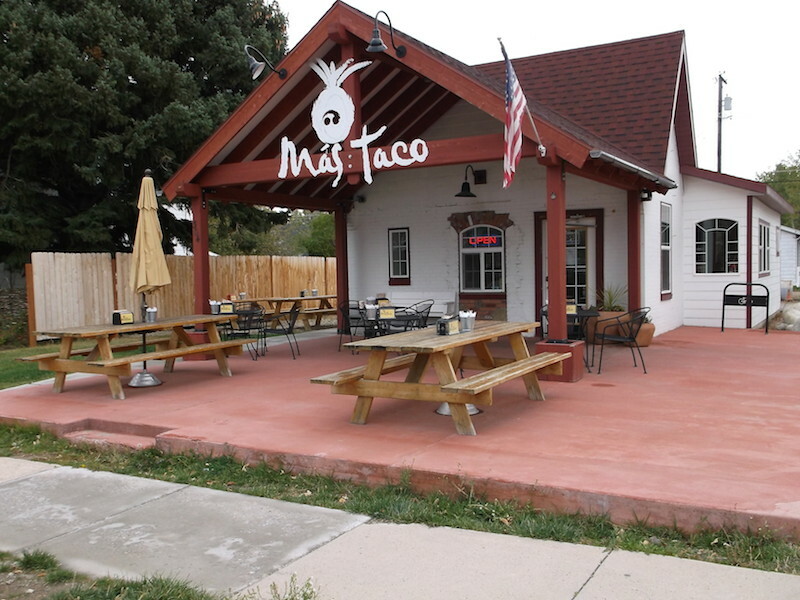 His Red Lodge restaurant, Mas Tacos, offers al pastor — served five different ways — as its specialty. This entry was posted in Food / Cooking and tagged Bear Tooth Pass, Más Taco, Mike Muirhead, Red Lodge MT.